Daffnet provides many benefits without the need to be a member or log into an account. View “excerpts” of recent messages on the Home page, with thumbnail photos. View responses about recent messages in the nearby panel, “Recent Comments”. View an entire discussion, the original message and all related responses. Use the green menu bar with major categories to find a specific topic; hover your mouse cursor over a category to view and click on a sub-category. Use the “Calendar” to search forum entries by date. Look at the “Archives” dating back to 2003. Click on an author’s name to see all of their messages. Use the “Search” panel to find information about a specific topic or a person anywhere in the forum. Click on a category and use the “Search” panel to find information within the category. Share Posts and messages with your favorite social media. The green menu bar may become your favorite tool! It is the quickest way to see just posts and comments in a category without having to wade through subjects that do not interest you. Based on our review of existing Daffnet messages, we selected categories for grouping all posts and messages. We anticipate our members will suggest additional categories as we all gain experience with the new Daffnet. Please let us know if you think of another useful category. All messages are placed in one or more categories that best suit the subject. General – American Daffodil Society, Daffodil Enthusiasts, People Awards, Publications and Resources, Societies and Groups, Displays and Specialty Exhibits, Youth, Non-Daffodil. The Search, Calendar, and Archives panels are all intended to help you search or find a message as quickly as possible. Perhaps the Search panel will be most appreciated. If you are interested in how to recognize a virus on your foliage, you do not have to look at a myriad of messages about the topic of the moment. Instead, you can go directly to the Diseases & Pests category and review photos and descriptions or Search on the word “foliage” within this category. Now that you know many things that you can do without logging in to Daffnet.org, it is time to talk about contributing content. Contribute your own Posts and messages. Respond or comment on other member’s Posts and messages and even your own. Contribute your photos. We have great news for you photographers. Contribute other media like PDF documents. In order to contribute a post or comment, you must become a member by signing up to join Daffnet and be logged in. To do this, you will need an account and password. The Daffnet.org “Help” panel has more detailed information about Registering and logging in. A primary goal and advantage of this web-based forum is that everyone on the Internet will be able to learn from the interesting discussions, advice, scientific findings and beautiful photos sent by our members. 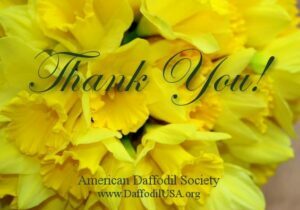 We consider this a giant step towards continuing the American Daffodil Society’s mission to educate the public about daffodils.